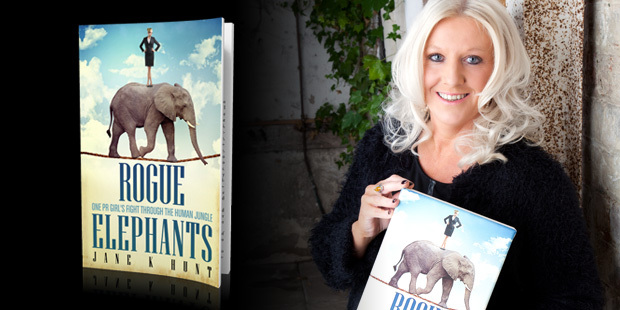 ‘Rogue Elephants’ is the PR book of 2013, covering the long PR career of Jane Hunt, who was crowned the ‘Best Freelance PR Practitioner’ in Britain at the Chartered Institute of Public Relations Excellence Awards, 2012. 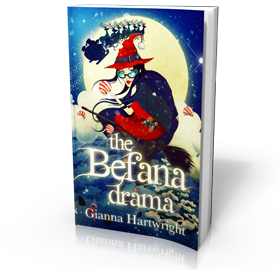 It also focuses on the many interesting characters that she has met along the way. The book covers her journey through the world of public relations, beginning in the 1980s when she had her heart set on being a PhD student at Cambridge and then moving on to her first real job – as executive secretary to the Japanese directors of a stockbroking company in the City of London. From there, she was launched into the world of PR through her role as international press executive for a global freightforwarding organisation – a role that led her to have one of the funniest encounters detailed in the book. What follows are years of ups and downs, bizarre incidents, thought-provoking episodes and personal challenges of the highest order. At times readers of this book will be laughing out loud and at other times moved by the feelings that Jane conveys through her self-deprecating yet witty copy. This book is about the real world of PR, a world removed from that of the big London PR agency at times, with pink-spangled wellingtons and a shovel having to be packed prior to meetings at a rural farm or tearoom. At other times, it leads us to the heart of life in London, working for one of Britain’s largest organisations and sponsors. But this book is not just for people working in public relations. 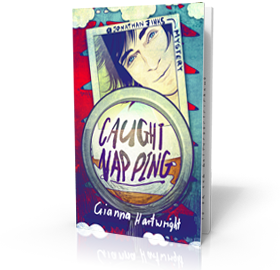 It is a witty read in itself, full of strange twists and turns and odd situations, with Jane’s words painting pictures of all that has occurred in her life both at work and at play. 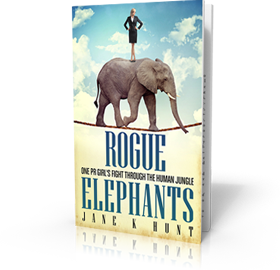 ‘Rogue Elephants’ is an inspirational read for any woman who wants to be a success against the odds. Jane has been a single mother for 20 years, faced alopecia and even received death threats. Despite everything, she has achieved her ultimate goal of being declared Best in Britain. Read the book and be inspired to aspire, to dream and to remember that there is no such word as can’t! During her long career in PR, Jane Hunt has experienced a few personal scares that highlight the care that any woman should take when working, making appointments with strangers and heading out alone. For this reason, every copy of ‘Rogue Elephants’ sold will generate a donation of 10 pence for the Suzy Lamplugh Trust (Charity No.802567), to assist the valuable work that the Trust carries out in highlighting the issues relating to personal safety for women. ‘Rogue Elephants’ is on sale as both a print and e-book at Amazon and as an e-book at Kobo and Lulu. Any PR course tutor or independent bookstore wishing to place multiple orders should contact giannah@me.com to discuss pricing. Discounts can be negotiated.